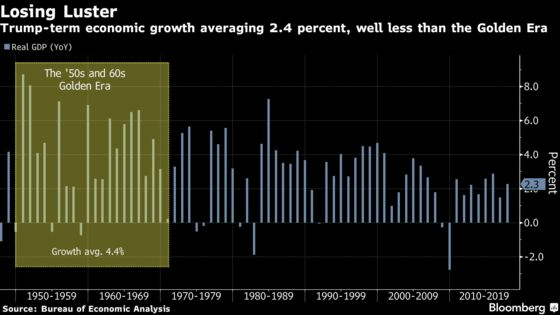 (Bloomberg) -- President Donald Trump has plenty of room to brag about the American economy. Calling it the “greatest” on record may be a stretch. Indeed, the economy has made major progress since the Great Recession ended in 2009, and that improvement has continued -- and even strengthened by some metrics -- during Trump’s 16 months in office. 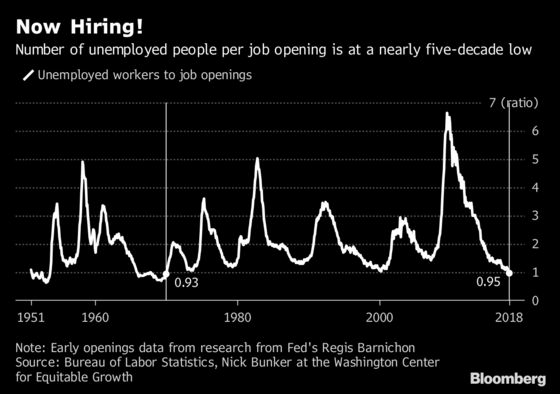 Jobless rates among minorities are at or near record lows, openings are at an all-time high and there are more positions available than there are unemployed. 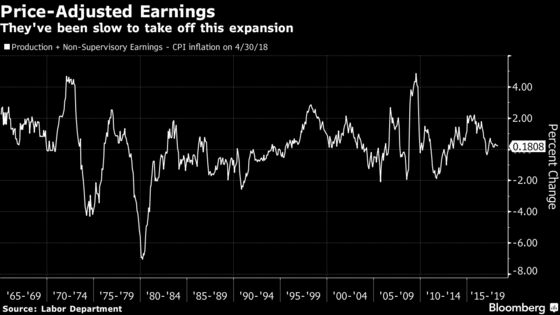 Yet wage growth is moderate, productivity remains tepid and expansion has averaged 2.4 percent on a year-over-year basis since Trump took office, well below the 4.4 percent of the 1950s and 1960s. 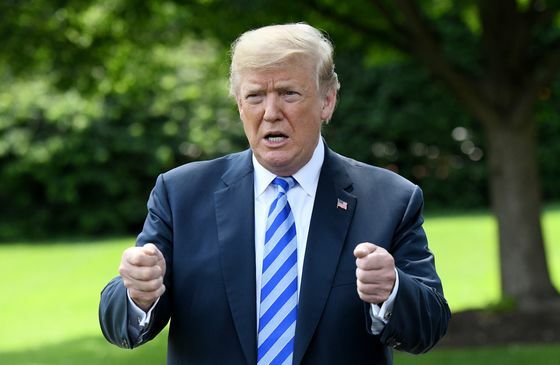 Read more: Trump Claims the Economy Is Becoming Great Again. Is It? 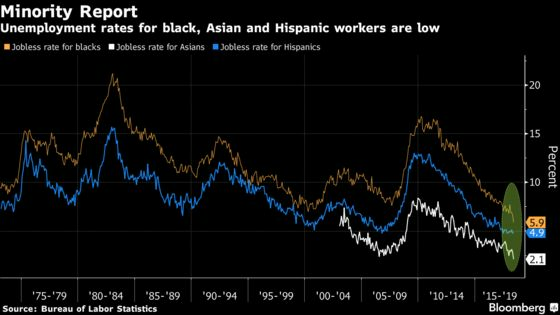 Unemployment rates are also at or near the lowest on record for black, Asian and Hispanic workers -- a fact Trump has highlighted. Still, the overall jobless rate -- 3.8 percent in May -- has been lower in the past, dipping below 3 percent during the 1950s. The time it takes unemployed people to find work also remains elevated. And while wage growth has slowly picked up, past expansions have seen much bigger gains. That’s true even after accounting for today’s modest inflation. Katz noted that in the late 1960s and late 1990s, wage growth was booming for such everyday employees. And in the 1960s, jobs put workers on a path toward benefits and economic security in the longer run -- more of a rarity today, in a world where unions and pension plans are few and far between. Therein lies the trouble with declaring that today’s economy is -- or isn’t -- the “greatest” ever. Economic progress depends on long-running, hard-to-change trends like labor force size and growth, so making comparisons across time is like judging pancakes against crepes. With different quantities of the key ingredients, results will vary. In the U.S., where an aging population has been holding down the labor participation rate and birth rates have waned, demographics alone make the GDP figures seen in prior decades tough to match. The White House economic team appears to be cognizant of America’s tempered prospects -- and optimistic within those more-limited parameters. “Virtually every economist” said 3 percent growth couldn’t be achieved, and “we are now moving into 3 percent zone -- that is a huge achievement,” Larry Kudlow, Trump’s top economic adviser, told reporters Wednesday when challenged on the president’s assertion that the economy is the best ever. Progress on boosting growth “in my judgment, is only just beginning,” he said.